The ears are just a way for sound to get in for processing by the brain (Carol Flexer). Hearing is a first-order event for spoken language, reading, and learning which is all based on early development of the auditory centers of the brain. As of June, 2013, statewide data from North Carolina indicated that 92% of families wanted their child to listen and speak, whereas only 6% chose simultaneous communication, 2% chose ASL, and 1% chose Cued Speech. It is clear that parent choices have changed dramatically over time as 40% chose spoken language in 1995, which increased to 85% in 2005. The success of developing age-appropriate speech and language skills is built on early, consistent auditory stimulation which is the foundation of development within the auditory cortex of the brain. The auditory cortex is the most highly organized processing unit of sound in the brain. 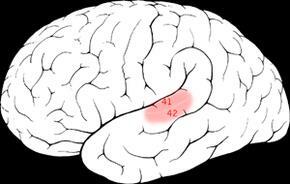 This cortex area is the neural center of hearing, language and music, identifying the fundamental elements of pitch and loudness. The right auditory cortex is more sensitive to tonality, while the left auditory cortex is more sensitive to minute sequential differences in sound, such as in speech. The ability of the auditory cortex to function is highly dependent on the sounds encountered early in life. 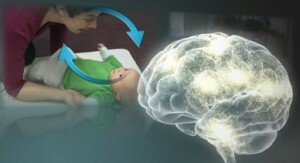 Importantly, the development of brain structures in the auditory cortex to process the minute and rapid changes in pitch and loudness necessary for speech and language development is secondary to consistent stimulation starting prior to birth (4 months gestation) and continuing throughout early infancy and early childhood. These changes to the auditory cortex last throughout the individual’s life. The same exposure to auditory stimulation outside of that period causes no lasting change in the development of brain structures to process pitch and loudness. Thus, there is a critical window for auditory neural development. Studies in brain development show that sensory stimulation of the auditory centers of the brain is critically important and influences the actual organization of auditory brain pathways. The critical language learning window is secondary to the development of sensory input processing centers in the brain. This, this critical period extends from birth to approximately 3 years of age when brain neuroplasticity is the greatest. Evidence indicates central auditory pathways do not develop normally in the absence of sound stimulation. This means that the historically poor speech and language skills in children with hearing loss have been due to underlying neurophysiologic deficits in central auditory development caused by the absence of early acoustic stimulation during optimum periods of central auditory system plasticity. Thus, hearing-impaired infants are at risk for abnormal maturation of central auditory pathways if they do not receive adequate sensory stimulation through amplification and, consequently, they will be at risk for delayed or abnormal speech and language development. Given that the central auditory pathways are maximally plastic only in the early years of development, there is a limited time frame for determining whether conventional amplification is providing the stimulation needed for auditory development. For example, it has been shown that congenitally deaf children who are fitted with cochlear implants late in childhood (after age seven years) show delayed central auditory maturation. On the other hand, children who are fitted with cochlear implants within a sensitive period during early childhood (by age 3.5 years) show normal central auditory maturation within six months of implant use. As we look further into brain development, the foundation of the development of auditory cortex structures to process minute sequential differences in sound, such as in speech, occurs significantly earlier than 3.5 years. Early structures within the brain develop based on consistent sensory stimuli. When born, infants with typical hearing have brains with approximately 2500 synapses, or connections, per neuron. As a result of constant stimulation, the number of synapses grows to 15,000 per neuron by the time a child is 2-3 years old. At age 2-3 years “synaptic pruning” starts to happen. The weaker synaptic connections are eliminated while the stronger connections are kept and strengthened. Thus, if the synapses within the auditory cortex have not been constantly stimulated via amplification and frequent, effective communication with the young child by the age of about 2 years, the majority are likely to be pruned away in the next year or so in favor of the stronger visual processing structures. To summarize, hearing is a first-order event for spoken language, reading, and learning. Consistent listening experiences in early infancy (birth through age 3) are critical for the development of speech and language in young children and sets the foundation of a strong spoken language base that is essential for reading. 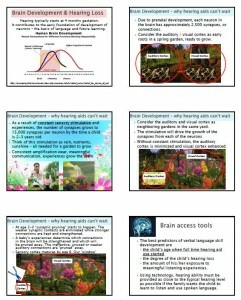 Posted by Karen L. Anderson, PhD, Supporting Success for Children with Hearing Loss, February 17, 2012.